Loops can hook to grooming posts or any hook to make the noose length variable. Made with squeeze locks so dogs cannot slip the noose off. Aircraft Strength. Flexible steel cable coated with a vinyl coating and has a soft, cushioned covering that won't rip, rub, or tear around pet's neck. This chew-resistant grooming noose stays dry even when wet. An indispensable product for all grooming arms and pet bathing tubs. 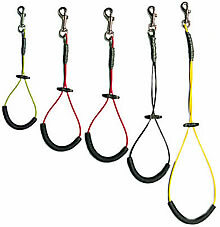 The grooming loops have maximum strength and durability. Made of the highest quality materials available. The hardware is made of brass, aluminum and stainless steel. Colors vary, no color choice available. Will not absorb dirt or odors. Use from table to bath, will not absorb water. Even comes with a lifetime rust-proof guarantee. Sizes 14" to 22" available.